A health-monitoring study involving wrist-worn motion monitors and body-composition measurements last year found health declines and deteriorating reaction times among firefighters as the wild-land fire season progressed. BOISE, Idaho — Randy Brooks’ son had a request three years ago: What could his dad do to make wild-land firefighting safer? To Brooks, a professor at the University of Idaho’s College of Natural Resources who deals with wild-land firefighting, it was more of a command. His son, Bo Brooks, is a wild-land firefighter who a few days earlier during that 2015 fire season fled a wall of flames that killed three of his fellow firefighters in Eastern Washington. But a self-selecting online survey is not necessarily representative of what’s happening in the field. So Randy Brooks decided to apply some science. That led to an ongoing health-monitoring study involving wrist-worn motion monitors and body-composition measurements that last year found health declines and deteriorating reaction times among firefighters as the season progressed. Some 19,000 firefighters are currently in the field fighting nearly 40 large wildfires. 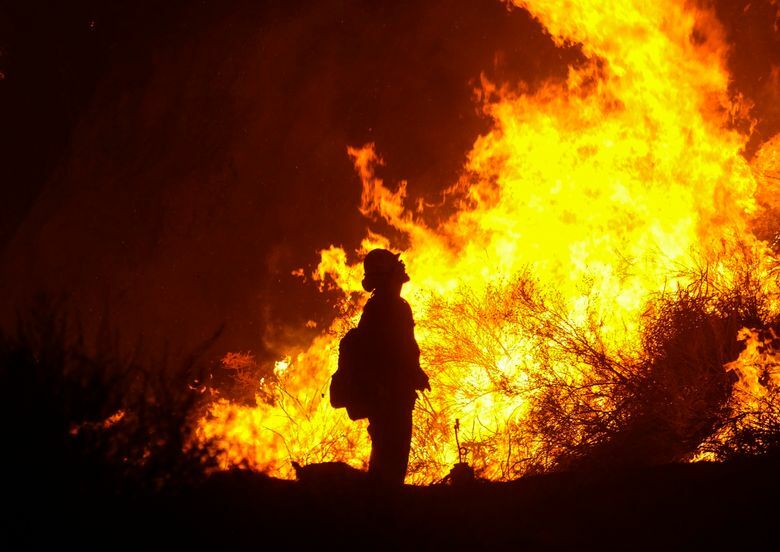 Fourteen firefighters have died this year as wildfires have scorched about 3,500 square miles and destroyed some 3,000 homes. The firefighters wore a wrist device called a Readiband from a company called Fatigue Science. The device keeps track of how many hours of sleep a person gets. Formulas developed by the U.S. military then calculate fatigue, based on a lack of sleep. That’s used to predict alertness and reaction times, which get worse as fatigue levels rise. Firefighters in the field can get six hours of sleep or less each night. The devices found that not only did reaction times falter as firefighters remained longer on a fire before getting a mandatory break, Brooks said, but firefighters also tended to take longer to recover as the season progressed. Sometimes, fatigue reached a level that suggested reaction times slowed down so much it took firefighters twice as long to react. Brooks said his initial thoughts are that wild-land firefighters might need better nutrition to stay fit and mentally sharp. But last year’s study had only nine firefighters. Brooks this year has expanded the study to 18 firefighters, 16 men and two women. They’re smokejumpers, meaning they parachute from airplanes to fight fires. Brooks said that next year he hopes to have about 100 firefighters and include hotshot crews, a ground-based wild-land firefighter that can, like smokejumpers, be deployed on a national basis. Smokejumpers in the study often eat pre-made meals. Brooks wants to find out if maybe those meals are behind some of the puzzling results from last year’s study, such as a loss in muscle mass. Hotshots, meanwhile, can return to a central spot where they get prepared food supplied by the U.S. Forest Service. That agency has done extensive research on what it takes to keep wild-land firefighters fueled, and contractors who supply the meals must meet Forest Service nutritional guidelines. Joe Domitrovich, an exercise physiologist with the Forest Service’s National Technology and Development Program in Missoula, Montana, said that experiment led the agency to change gears and recommend firefighters snack during their shifts to keep glucose levels up. “It’s critical for cognitive function as well as physical movement,” he said. Brooks said at this point in his study there are more questions than answers. For example, one question is why so many firefighter deaths are due to falling branches or trees. The deaths of three of the 14 firefighters who died last year were due to what are called hazard trees. At least one firefighter was killed by a falling tree this year, and several more have been injured. “What I’m trying to figure out is what is causing these accidents,” Brooks said. A fair number of wild-land firefighters also die of heart attacks during the season. Brooks said he wants to know if there’s something about the demanding seasonal job that puts wild-land firefighters at greater risk of heart attacks.